I have been meaning to write a more detailed post on how I constructed Whazzat’s costume from Zoobilee Zoo. Hopefully this may help you a bit if you decide to make this costume! I will say, it probably cost around $100 after I purchased everything - probably more. It was a lot of work putting it all together, but it was such a fun costume to wear – and hopefully I’ll have more chances to wear it in the future! I used a pattern to make the basic kangaroo outfit. It is a McCall's Costume Pattern (It says "Easy" on it, and it wasn't too hard to put together), pattern #M6106. I got the adult size Large (for size reference, I usually wear a US size 12/Large in most clothing, and am 5'10"), and I will say this was WAY too big! Thankfully, I started with a muslin, and adjusted that before cutting into the fleece (took in several inches everywhere, and added length in the arms, torso and legs). I should have gone with a Medium, at the most. I think the pattern is going for a looser look, so that may be part of the reason it was so big. Whazzat's outfit is definitely more form fitting. If you want an easier option, I also looked into getting adult full body pajamas. Here are a few options: Pajama Company; My Party Shirt. I decided not to go with this because of cost, and I still would have had to add a pouch, ears and tail. It would have a saved a bit of time, and if you aren't comfortable with sewing, this would be an easier option. I purchased most of the material at JoAnn Fabrics. One, they have a wide variety of different materials, and two they have lots of sales! I used many 40% off coupons to help cut costs. I know most people have a love/hate relationship with this store, but for a Halloween costume, I can’t justify spending a lot of money on high quality fabric and materials. Purchases from JoAnn's: light pink fleece for the main body; ½” wide pink satin ribbon for the ballet shoe "laces" (I think I purchased 2 spools); teal (at least 3 yards, maybe more), yellow (at least a yard) and pink fabric (1/4 yard) for the vest, hair bow and tail bow (I tried to get the best color match, and then went for the cheapest option); fake lace trim for detailing on the vest (I think at least 2 spools); fill/stuffing for the tail; ¾” Velcro for the vest, zipper for the main body; and the McCall's pattern. The pink tights were purchased on Amazon. The wig was purchased from Ebay, but you could also check Amazon. Pink gloves were purchased in store at Walmart or Target. And the ballet shoes I already had from taking dance in school. I used a light pink face make-up (like from those cheap Halloween kits you find at a big-box store) to finish the look! I am very excited to announced that I am published in a book! About a year ago I had the opportunity to submit a quilt design for an optical illusions book Kansas City Star Quilts was putting together (thanks Shea for letting me know about this project!). This was the first time I had created a quilt design for a specific project, and it was hard! It took me awhile to figure out what my design should be, but in the end, I am happy with the results. And KCSQ was so easy to work with, which was helpful for a newbie like me. Above is the design as I submitted it. You can see that the block is very versatile, so you can play around with the direction of your blocks, and you'll get different effects. It works great in different sizes too. The 80" x 80" (16 blocks) is a great large lap quilt, and the 40" x 40" (4 blocks) works great as a baby or wall quilt. You can see the smaller quilt in the photo below. If you make this quilt, I would love to see it! When I showed my mom the design, she was not excited about all the pieces, but I hope you aren't dissuaded by that! 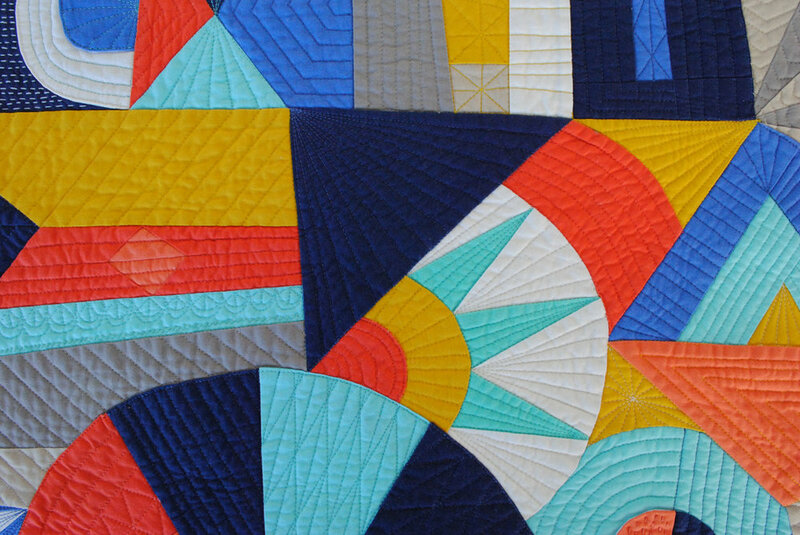 If you like triangles and matching points like I do, than you will love this quilt. It has a lot of impact when it's all sewn together, so it will be worth it! You can get your copy of the book here. My friend just had her second child, a boy! Designing quilts for a second baby is kind of difficult. Do you do something different, but what if one looks or seems more superior? I was a second child (ended up being a middle child) so I have very strong feelings about further children not getting screwed (my sister always seemed to get the better versions of everything). So I decided the best thing was to do something similar, but different (you can see her daughter’s quilt here). I got the color palette from my friend and decided on an octagon for the shape. I used the same quilting as before, and used flannel on the back. I can’t wait to see her baby boy on his new quilt! Napkins were from Oh Joy's Spring Target line. Paper plates are from Shop Sweet Lulu. There's a variety of tissue paper issued, but the mint green/coral/pink is from Paper Source. Savannah has become one of my favorite places to visit. It has a little bit of everything, from the old historical charm of the South to the beach on Tybee Island. It’s equal parts relaxation and adventure, and small enough that it’s easy to get around and not too crowded. I’ve been lucky enough to visit with my good friend Em as a tour guide, and will be going back again in a few weeks to celebrate her bachelorette party. Em went to school at Savannah College of Art & Design (SCAD), so she spent 4 years getting to know the area really well! -You can taste all the different flavors of their honey! -One of the best shops ever, it has an eclectic mix of new and old items. -The best ice cream in Savannah. The line can get pretty long, but if you go during off hours you can avoid longer waits. This art school has played a big part in the revitalization of the city. They have fixed up lots of old buildings as part of their campus. -ShopSCAD carries a wide variety of items made by SCAD alumni and students. -Kind of a dive, but it’s so good (well, I always get the same thing and it’s delicious, The Elvis: peanut butter and banana french toast). It was also in the book/movie Midnight in the Garden of Good and Evil. We stayed on Tybee the first couple of years we visited. Last year I stayed at Planter’s Inn. It’s in a great location, and was affordably priced the weekend we were there. Next door is The Old Pink House, a nice restaurant, though a little pricey. Each room has a different ambiance to it. They also have an outdoor patio upstairs that’s nice at night. The lowest level has a little bar lit mostly with lanterns/candles, with live music and special cocktails – it’s really neat! You’ll want to make reservations, especially if there’s a specific area you want to dine/drink. A short drive from Savannah, Tybee has a small town feel, and is a great place to visit the ocean. -North beach is generally less busy, and just as nice. The lighthouse is also on north beach. South beach has all the little shops and a nice beach as well. There are jellyfish in the water, and usually some dead ones on the beach – just something to look out for. -It’s fun to climb the lighthouse, and get a 360 degree view at the top. You can see the ocean and marshes from up high, which is nice. The also have a museum in the house the lighthouse keeper’s family lived in, has lots of neat old stuff and some nice quilts. Some other fun things: Cute fabric boutique shops: Fabrika & Measure; Juliette Gordon Low House (founder of the Girl Scouts); ride a Vespa. Want a little taste of Savannah/Tybee, but can’t get there soon enough? Watch these films: Midnight in the Garden of Good and Evil, Forrest Gump, The Last Song. Last year we tried a DIY Sub Irrigation Planter (SIP) for the first time. A SIP is a planter system where water is introduced from the bottom of the planter. This allows plants to have a constant source of water, and also saves you, the gardener, from having to water as often. We have an upper deck that gets pretty good light and were interested in a having a few container plants. We had tried cherry tomatoes in the past, but had issues with them splitting in the heat. Especially in the middle of the summer, we’d water the plant in the morning, and by the time we got home from work the soil was completely dried out. This also made it hard to leave for more than a few days, and we didn’t want to be reliant on friends coming by to water for us. We got a book from Jesse’s brother called Fresh Food From Small Spaces, and this is where we first learned about SIP container gardening. We were intrigued, and Jesse did lots more internet research (he loves to research things) to learn more about how we could apply this ourselves (this is a pretty good site to learn more). You can purchase SIP containers read to go, but I wanted something that was a little more aesthetically pleasing than what is out in the market, and we already had two tall planters my mom had gifted to us (and I really like overcomplicating things). We tried this for the first time last year, and it worked out pretty well. We had more success with the cherry tomatoes than the bell peppers, but that could be for a variety of reasons. Our planters worked out great to convert to a SIP. The extra height allows enough room in the base for the water reservoir. Dimensions will vary depending on the planter you use, but as a reference, here is what we were working with. Tulip planter (widens at the top): 20”tall, 14” diameter at the top, 9.5” diameter at the base. 2 gallon bucket: 9” tall, 9”diameter. Planter, bucket/container for the water reservoir, PVC pipe for the fill tube, plastic water bottle for the soil wick, plywood/wood/bucket lid for the platform, landscaping cloth (not mandatory), and a mason jar to fit over the fill tube opening. 1. Find an appropriate planter (my mom purchased ours from Piney Ridge in Johnston, Iowa). 2. Find a bucket/container (the water reservoir) that fits snugly into the bottom of the planter. It still needs to have a little extra space on the sides, so when the reservoir becomes full*, the extra w­ater will spill over the edges, and out the bottom of the planter. Our bucket is made of HDPE (high-density polyethylene) food grade plastic. *If you can/want to drill holes into your planter, you can drill drainage holes near the top of the water reservoir, and this will allow the extra water to flow out through the openings. 3. The platform piece should fit on top of the bucket/container. We used untreated plywood*. The platform is the same diameter as the bucket. You will need to cut two holes, one the diameter of the water bottle you will use for the wick (placed in the middle), and a smaller hole that is the diameter of the fill tube (off to the side). *We may try finding a bucket with a lid next year, and using the lid as the platform. This may be more efficient than what we currently have. 4. We purchased a large bottled water to use for the wick (the extra large size). Jesse cut the top off, and drilled several holes into the plastic. It wasn’t quite tall enough to touch the bottom (it should be slightly taller than the bucket), so he added a few pieces of leftover plywood to the bottom. Gradually fill plastic bottle with soil, watering the soil and compacting down the soil as you add more so it is very dense. 5. Place wick in center hole, make sure top is flush with the platform. 6. Cut the bottom of the PVC pipe (fill tube) at an angle to ensure the water can flow into the bucket. Add fill tube through smaller hole in platform. 7. Add landscaping fabric*. You won’t need much landscaping fabric, so we asked some friends who were homeowners, and one had lots of extra that he was happy to pass onto us. You can adjust the fabric as you add the soil. If you can, try to keep the fabric above the soil line. *Not mandatory, but can prevent roots from getting into the water reservoir. We used landscaping fabric last year, and the bell pepper roots still made it around the landscaping fabric and started down the side of the fill tube. I don’t think this affected the peppers at all though. 9. Place plant into dirt. Place a cover over the fill tube when not in use. A mason jar works well. This does a couple things; it keeps mosquitoes from going into the tube and laying their eggs in the water, and also keeps other stuff from clogging up the tube. We’ve figured out a water management system, but now need a pest control system. We made it about half way through last season before the squirrels found our tomatoes (they left the pepper and other plants alone). They have already found the plant this year, and started to eat the leaves of the tomato plant! It really pisses me off, and we are working on a system to keep them out of it. We are trying bird netting, but haven’t quite figured out the logistics yet. If you have any suggestions, let me know! Download the template below, print and cut out, and adhere onto clothing with double-sided tape. There are enough badges on one sheet for you, your friends, family and co-workers, so spread the love! Last week a friend had a mini Easter swap. Each person brought something they made for the other people participating in the swap. I thought of a great idea the month before, and than ran out of time. So, this was the backup plan. It was fairly easy to put together, and didn’t take too much time. I used a dremel tool to drill tiny holes in the bottom, and spray painted them gold. I tried a couple other colors including a pink one that looked like strawberry jello (!) but the gold spray paint coated the easiest, dried the fastest, and is a neutral enough color that people could place it in their home. I bought some cacti potting soil, and replanted them in their fancy new/old pots. I have to admit, I fell in love with the mini JELL-O molds, and felt guilty about drilling into them and painting them. I think I will now keep my eye out for more next time I’m at an antique shop! I had the first Movie Foodie of the year a few weekends ago. 13 Going on 30 seemed like an appropriate film for my 30th year. 13 Going on 30 is such a cute movie, Jennifer Garner is adorable in it and Mark Ruffalo plays the perfect guy you love to love. I chose Razzles as the key food item, and wrapped them up as favors (along with some "wishing dust" sprinkled inside) for the guests. Other food items included a veggie tray and “pigs in a blanket” from the birthday party scene, and strawberry chocolate chip pancakes from Jenna’s visit to see her parents. Piña coladas were the drink (my first time making real ones, they are easy too! I couldn't find the cream of coconut at the grocery store, but found it at a liquor store) and guests could keep them “virgin”, or make them “not virgin”. For décor, I bought some silver fringe and used the laser machine at work to cut out the quote “30, flirty & thriving”. Also, I made it pajama party themed, a perfect excuse to wear pjs while watching a movie! There are a few ways I choose what movies are best for Movie Foodie night. First, it’s a girl’s night, so I don’t have to worry about pleasing the dudes. Romantic comedies are totally acceptable. Secondly, the movie can’t be too serious – which means nothing that will make me, or others cry. The ending of Big Fish makes me cry every time (I only watch this one by myself, I prefer to cry alone so I can really enjoy it). As much as I love Big Fish, it won’t be Movie Foodie night. Third (which should probably be the first) - does food play a role in the movie? I wouldn’t call any of the movies I have shown, “foodie” movies, but either the food is a part of the plot, or becomes a prop between characters. But, some movies are just fun to throw a party for. My next Movie Foodie in October is Beetlejuice. I have no idea what the menu will be, but I’m so excited to decorate for it! I love May Day. As a kid we would put May Day baskets at our friend’s doors in secret – they usually involved strawberry baskets and popcorn. I can’t remember why you weren’t supposed to get caught delivering the baskets, but it was a lot of fun. I made six of these baskets 2 years ago, and they are still one of my favorite craft projects. I like to think of May Day as a celebration of spring and Earth Day, so I tried to keep everything recycled or usable. Flowers are an important component of the holiday, and in this case I used Celosia, because it is a bright and happy plant. The “pots” were parfait glasses I found at an antique shop (they were really cheap too, about a $1 a piece!). The plant picks where made by rolling out Sculpey (the kind you bake) and stamping letters in it using my William Sonoma, Message in a Cookie kit. The baskets where made from cereal boxes (really simple with a bottom and 4 sides, and held together with washi tape). The handles double as headbands. They are strips of fabric braided together, and sewn onto elastic. Deco Rush - Japanese "tape"
A co-worker told me about this awesome product from Japan and I immediately had to purchase one for myself. It’s similar to white out tape, but it has cute little illustrations on it instead. While it’s called tape, it’s not really like tape. It sticks to the paper, almost invisibly, but it can’t adhere something together like tape would. Best for decorating notes, envelopes and mail – any paper product really! The only problem I’ve had so far is the tape occasionally breaking apart. Applying even pressure usually fixes the problem though. I bought a set that includes the tool, and three cartridges. They are really easy to change out, so you can purchase several different illustrated tapes. This set has clouds, airplanes and zephyrs, and hot air balloons. I also bought a cartridge that has colorful sloths wearing party hats!